This book sequentially covers clinical methods, clinical cases, investigations, diagnosis and therapy principles in a concise form. It guides the student with the correct way of history taking and clinical examination which will help them in identifying the clinical signs. 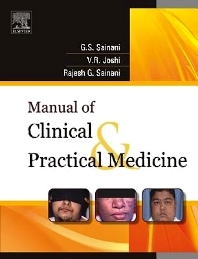 In the first 9 chapters, the manual covers in detail the bedside clinical methods under the following heads: history taking and general examination, gastrointestinal system, cardiovascular system, respiratory system, neurology, nephrology, endocrine and metabolic diseases, hematology and oncology, and musculoskeletal system. The salient feature of the book is description of 100 cases along with viva voce of important cases. The method in which the symptoms, bedside clinical signs, synopsis of clinical cases have been sequenced will make it easy for the students in the clinical part of the examination. Chapters 10–15 cover electrocardiography, imaging, procedures, diet, table viva voce and emergencies which will help students to prepare for spots and table viva voce. The standard approach of interpretation and discussion of ECGs and x-rays has been discussed. The ECG and x-ray chapters carry 25 ECGs and 60 imaging pictures. Procedure chapter describes common instruments. Another feature of the book is an exclusive chapter on table viva voce covering 200 questions with answers. The manual is supplemented with 536 illustrations, 97 boxes and 45 tables. We believe that the manual should prove a key and core companion to the students during medicine practical examination.